The idea of approximate model counting, originally by Chakraborty, Meel and Vardi was a huge hit back in 2013, and many papers have followed it, trying to improve its results. All of them were basically tied to CryptoMiniSat, the SAT solver that I maintain, as all of them relied on XOR constraints being added to the regular CNF of a typical SAT problem. So it made sense to examine what CryptoMiniSat could do to improve the speed of approximate counting. This time interestingly coincided with me giving up on XORs in CryptoMiniSat. The problem was the following. A lot of new in- and preprocessing systems were being invented, mostly by Armin Biere et al, and I quickly realised that I simply couldn’t keep adding them, because they didn’t take into account XOR constraints. They handled CNF just fine, but not XORs. So XORs became a burden, and I removed them in versions 3 and 4 of CryptoMiniSat. But there was need, and Kuldeep made it very clear to me that this is an exciting area. So, they had to come back. But how to both have and not have XOR constraints? Re-inventing all the algorithms for XORs was not a viable option. 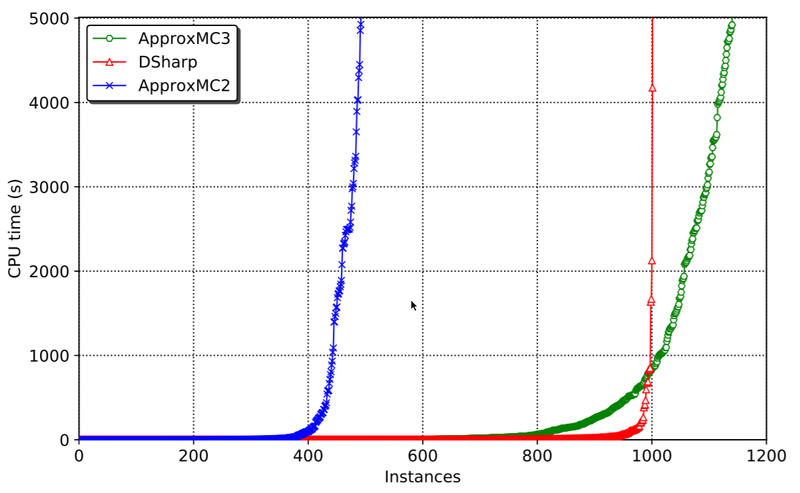 The solution I came up with was a rather trivial one: forget the XORs during inprocessing and recover them after. The CNF would always remain the source of truth. Extracting all the XORs after in- and preprocessing would allow me to run the Gauss-Jordan elimination on the XORs post-recovery. So I can have the cake and eat it too. Blast all XORs into clauses that are in the input using intermediate variables. I had all the setup for this, as I was doing Bounded Variable Addition (also by Biere et al.) so I didn’t have to write code to “hide” these additional variables. Run the CDCL and Gauss-Jordan code at the same time. Destroy the XORs and goto 2. This system allows for everything to be in CNF form, lifting the XORs out when necessary and then forgetting them when it’s convenient. All of these steps are rather trivial, except, as I later found out, recovery. This is almost equivalent to the previous set of clauses, but misses a literal from one of the clauses. It still implies the XOR of course. Now what? And what to do when missing literals mean that an entire clause can be missing? The algorithm to recover XORs in such cases is non-trivial. It’s non-trivial not only because of the complexity of how many combinations of missing literals and clauses there can be (it’s exponential) but because one must do this work extremely fast because SAT solvers are sensitive to time. The algorithm that is in the paper explains all the bit-fiddling and cache-friendly data layout used along with some fun algorithms that I’m sure some people will like. We even managed to use compiler intrinsics to use target-specific assembly instructions for hamming weight calculation. It’s a blast. Take a look. The results, as shown above, speak for themselves. Problems that took thousands of seconds to solve can now be solved under 20. The reason for such incredible speedup is basically the following. CryptoMiniSatv2 was way too clunky and didn’t have all the fun stuff that CryptoMiniSatv5 has, plus the XOR handling was incorrect, loosing XORs and the like. The published algorithm solves the underlying issue and allows CNF pre- and inprocessing to happen independent of XORs, thus enabling CryptoMiniSatv5 to be used in all its glory. And CryptoMiniSatv5 is fast, as per the this year’s SAT Competition results. Finally, I want to say thank you to Kuldeep Meel who got me into the National University of Singapore to do the work above and lots of other cool work, that we will hopefully publish soon. I would also like to thank the National Supercomputing Center Singapore that allowed us to run a ton of benchmarks on their machines, using at least 200 thousand CPU hours to make this paper. This gave us the chance to debug all the weird edge-cases and get this system up to speed where it beats the best exact counters by a wide margin. Finally, thanks to all the great people I had the chance to meet and sometimes work with at NUS, it was a really nice time.